When you design your commercial awning, you send a message to your community about your services. When people take notice, they will spread the word and generate more business! We already filled you in on why your restaurant needs an awning. But the truth is, awnings aren’t just beneficial for restaurants. Awnings are beneficial for all kinds of businesses. As a business owner, you are likely aware that the appearance of your storefront plays a major role in getting people through the door. If you can generate interest in your business based on the first impression of your exterior, you are more likely to sustain business in the long run. Let’s talk about how to boost business appeal with an awning. With the help of a new awning, more people will take notice of your business. Your awning doesn’t have to be too bold or colorful for your taste, sometimes a sleek and elegant solid awning sends the right message about your business. In either case, people tend to gravitate visually towards designs and storefronts that are aesthetically pleasing and stand out. Your new awning will represent professionalism and attract more customers. Awnings aren’t just for looks, they provide immense functionality as well! In the winter months, awnings provide shelter and safety from inclement weather. In the warmer months, awnings provide much needed shade from dangerous heat. If you shield your commercial property from extreme heat and cold, you increase energy efficiency and may benefit from a lower cost energy bill. The design of your business’s storefront should clearly display your brand, logo or service. If nobody takes notice of your brand, how can it grow? 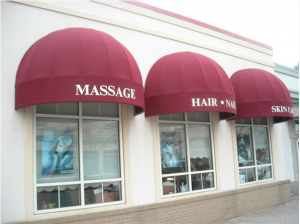 Awnings can be easily customized to showcase your business logo or signage. Be proud of your brand! The more people visually take notice of your brand, the likelier they are to use your services or recommend them. For example: John tells Sara he is in need of a good massage but doesn’t know a place. Sara says, “Come to think of it, I drive by a nice looking place that says they provide massages on my way to work every day. Try there!” In cases like these, word of mouth can be your best business friend. Check out a photo gallery of the commercial retractable awnings the Carroll Awning Company offers here. The Carroll Awning Company provides the best quality, energy-efficient awnings and frames for any business, restaurant, home, or apartment. We design, create, and install custom-created awnings all year round!